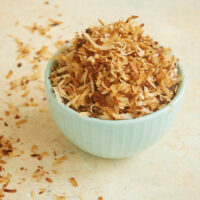 Toasted coconut is the richer, bolder version of coconut that’s a must for us coconut lovers. And it’s easy to do, too! These two simple methods will show you how to toast coconut for your favorite baked goods. 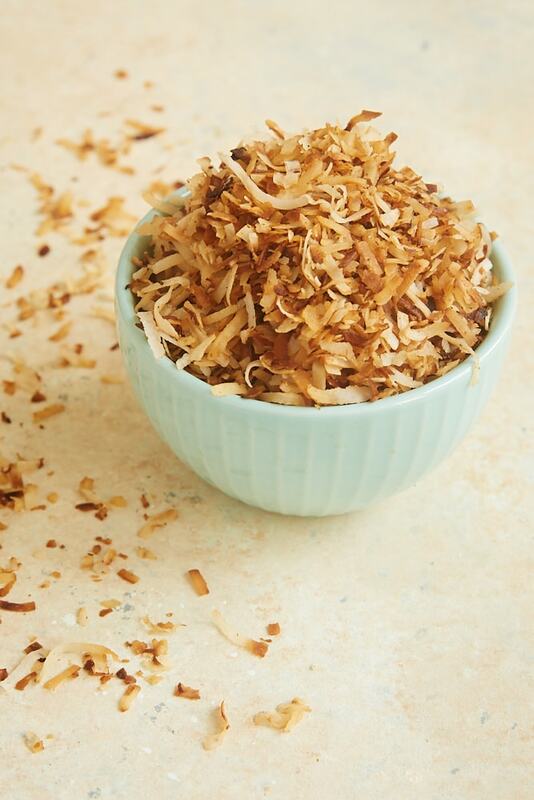 One of the simplest things you can do to enhance the flavor of coconut baked goods is to toast the coconut. If you’ve browsed the coconut recipes here on BoB, you’ve seen that I often recommend doing just that. The rich, nutty flavor is really irresistible. If you’re a coconut lover, then this is a simple skill you’ll want to master. First things first. Toasting coconut is so easy. Sure, it’s an extra step in a recipe, but I assure you that it is absolutely worth those few extra minutes. Now, for the particulars… I recommend two different ways to toast coconut. It can be done on the stovetop or in the oven. Both are easy and quick, so it really comes down to personal preference and perhaps experience. Toasting coconut on the stovetop requires a skillet and a spatula or wooden spoon. The coconut goes straight into the skillet where it cooks over medium-low heat. The advantage of the stovetop method is that it is easier to keep an eye on the coconut so it doesn’t burn. The drawback is that it takes a lot of attention and almost constant stirring to achieve even toasting. If you don’t have much experience toasting coconut, then you may feel more comfortable with this method because you can keep a close watch on the coconut. Toasting coconut in the oven requires a lined, rimmed baking sheet and a long-handled spoon or spatula. This method is more hands off. You’ll just need to stir the coconut a few times and keep a close eye on it in the last few minutes to prevent burning. If you’ve toasted coconut a few times and feel comfortable with the process, then this is an easier option in my opinion. It frees you to do some other things in the kitchen while the coconut is getting all toasty. Again, both methods are easy and yield the same result. Use whichever method you prefer that fits your skill level. Now that you are ready to get toasting, let’s get you ready to get baking, too! Find more coconut recipes in the Recipe Index. 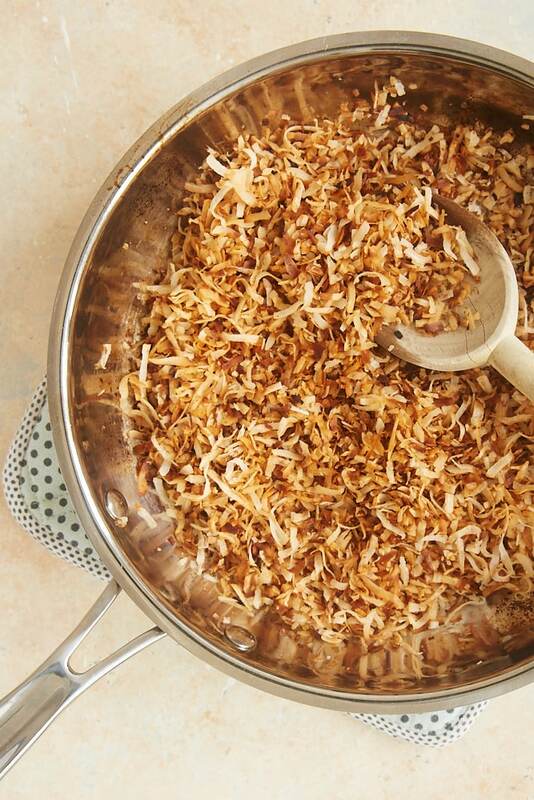 These two simple methods for toasting coconut make it easy to add the amazing flavor of toasted coconut to your baked goods. Place the coconut in a large skillet. Cook over medium-low heat, stirring frequently, until the coconut is browned. This should take about 10 minutes. 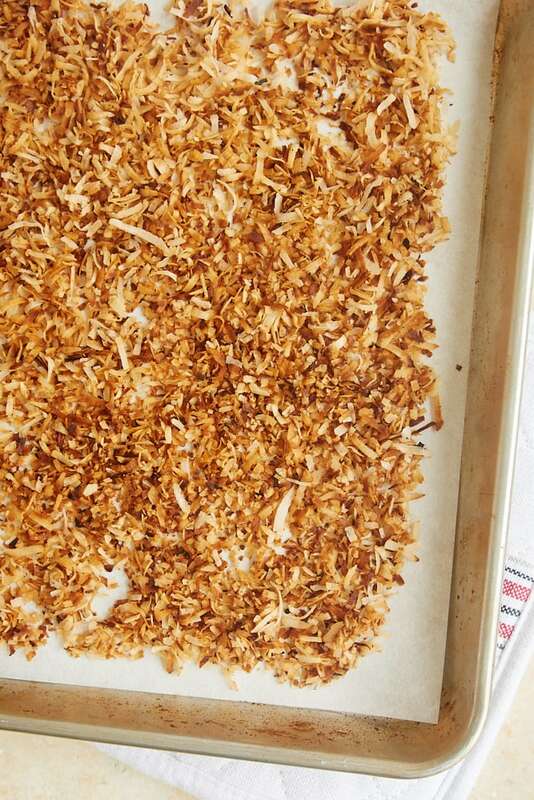 Spread the coconut in a thin layer on a lined, rimmed baking sheet. Bake at 350°F for 10 to 15 minutes. Stir the coconut every few minutes to help ensure even toasting.